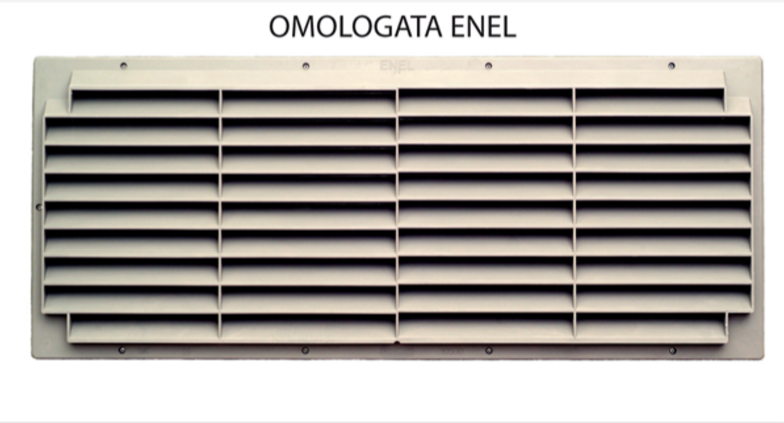 The grilles are made of ﬁbreglass-reinforces polyester resin (SMC), ENEL grey in color, self extinguishing according to the speciﬁcations ENEL DS 4974. They have a degree of protection of IP 33 in accordance with standard CEI-EN 60529 and IK10 in accordance with standard CEI-EN 50102; they also comply with technical speciﬁcations DS927. The grilles are used for the ventilation of MV/LV secondary substations. They are equipped with insect screen made of stainless steel with mesh 10×10 mm that can be removed, and with ﬁxing accessories.